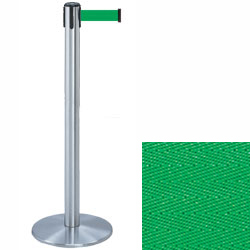 These chrome stanchions with green belt are ideal for controlling crowds, forming lines and separating areas in any location. This type of post has a round weighted base that will prevent them from falling over in high traffic environments. 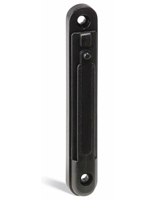 Each of the chrome stanchions has a 13' long retractable strap that can be used to form lines over large areas. In addition, the stands with a round weighted base feature a durable metal construction and a sleek silver finish that matches any décor. 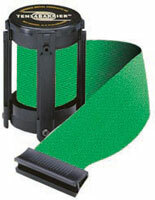 The crowd control stanchions measure 38" tall and are also available with a number of other strap colors.